I have a hard-working peach tree in my backyard. It isn’t big enough for the kids to climb in yet, and it is still producing smallish, but oh-so-sweet fruit. Every year when it blooms, my heart gets happy and I start anticipating juicy heaven. All the birds in Arizona start spreading get the word, too. Now there are nets you can put up to keep the birds out of the tree and away from most of the fruit. Our tree is too big now. I’ve seen the shiny hanging deterrents. My brother suggested hanging plastic balls that resembled the fruit to try and help them lose interest in our fruit. The thing is, every year we get very busy in the spring and don’t ever do all those things to bird-proof. 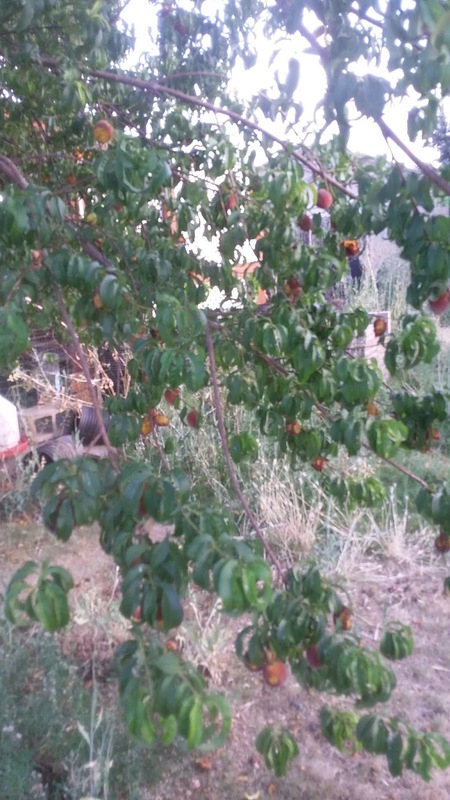 Can you see all of the peaches in various states of bird-eaten desiccation? This picture, you can't see that all of those peaches are bird-pecked, or completely eaten right on the branch--all of the usable peaches have already been picked from this part. All that fruit, ruined. Wasted. It's maddening. There are a few things go we could have done to prevent this. They don’t matter at this point, and the reasons why we didn’t don’t matter either. When I look at my tree, and all of those peaches that could have blessed my family, my friends, my tastebuds.... the reasons don't matter. We will either learn from this and take the necessary steps to prevent it next year, or we won’t and will lament the pillaging around May 2018 too. How often is it like this in life? We have so many blessing--some are things that we've worked hard for, others are just things that Heavenly Father has ordained for our good, waiting there for the taking. We also have the "birds" of our lives--people, circumstances, whatever--that hover around, waiting for opportunities to ruin those blessings or at least prevent us from accessing them. There are steps we can take to prevent this from happening, fully or partially depending on the circumstance. We understand that life, just by its nature, is going to ruin some of our "fruit," but whether or not needless waste occurs is largely up to our efforts. Then, knowing that without action on our part, our blessings will be squandered, we do--nothing. Or not enough. Or not the right things. What it is that we need to do is different for everyone, every circumstance. The reasons why we don't do what we know we should--those reasons don't matter when you come to a realization of what could have been had you only been diligent. What do we need to do to safeguard that fruit? Prayerfully study and ponder the Book of Mormon each day. If we want those blessings, we have to do that work. If we don't, we will see those blessings squandered, hanging on the tree waiting for us, but dried up with the waiting. Our service—whether great or small—refines our spirits, opens the windows of heaven, and releases God’s blessings not only upon those we serve but upon us as well. When we reach out to others, we can know with humble confidence that God acknowledges our service with approval and approbation. He smiles upon us as we offer these heartfelt acts of compassion, especially acts that are unseen and unnoticed by others. Each time we give of ourselves to others, we take a step closer to becoming good and true disciples of the One who gave His all for us: our Savior. By the way, although I am approaching this from a spiritual point of view, we can extrapolate my poor wasted fruit saga to writing also. How many times could we reap some benefits, if we would just take action? We can always improve our craft, look for opportunities to expand our writing horizons, network, mentor, critique, accept critiques.... we never know what blessings may arise from taking action--or what fruit we are letting rot on the tree by standing still. Well, I've been a major slacker about reading our blog lately, but this was just exactly something I needed to read about tonight. The imagery is powerful and important--it doesn't matter why the fruit was wasted, but it was. Thanks for this. I needed it.